Imagine: a material produced by nature, that can replace synthetic materials like plastics. A material that is grown from fungus and hemp. Meet the Growing Materials project: The Factory Of The Future. During a specialization project at the University of Rotterdam, Emma van der Leest, Zoe Agasi and LoekeMolenaar collaborated and started the Factory Of The Future. Emma is a student from the Willem de Kooning Academy in Rotterdam and has a passion for designing materials and products grown by organisms. Zoe and Loeke are both students Industrial Design Engineering from the University of Rotterdam, and are convinced that designing sustainable products isn’t an option – it is a must. This multidisciplinary collaboration resulted in a sustainable material grown by nature, that helps companies closing their loops and produce food in a more sustainable way. The final product is a mushroom tray, made out of mycelium and hemp. Mycelium is the pre-stage of a mushroom, while hemp is a waste-stream coming from companies producing clothes or in this case a city-farm producing vegetables. 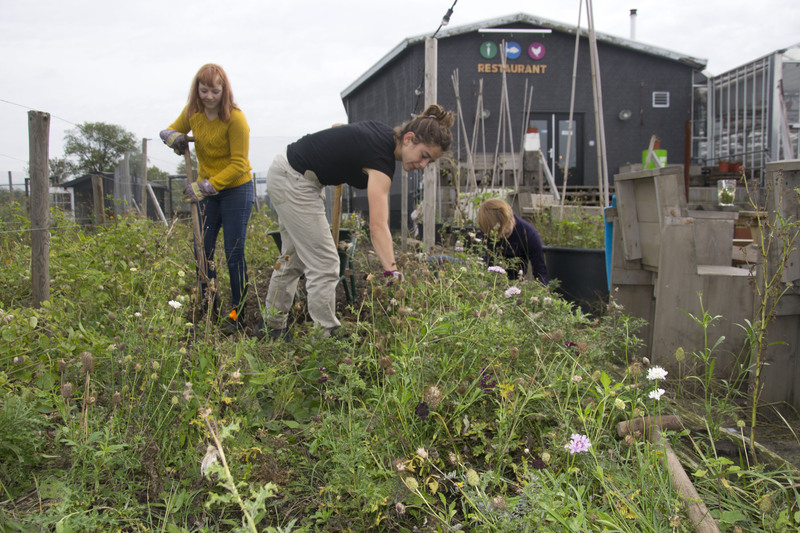 The city-farm ‘Uit Je Eigen Stad’* is constructing Europe’s largest Aquaponic-system** and uses hemp-mats in the aquaponic-system as a substrate for soil. 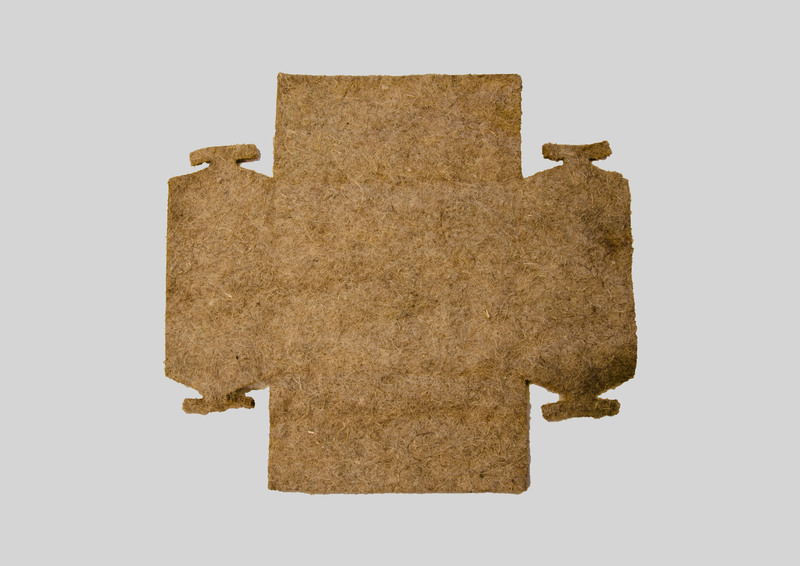 These hemp-mats can only be used once, whereafter they end up on the compost heap. Apart from growing vegetables, Uit Je Eigen Stad is also cultivating Shiitake-mushrooms. For the cultivation of the mushrooms, Uit Je Eigen Stad buys mushroom cultivation blocks. 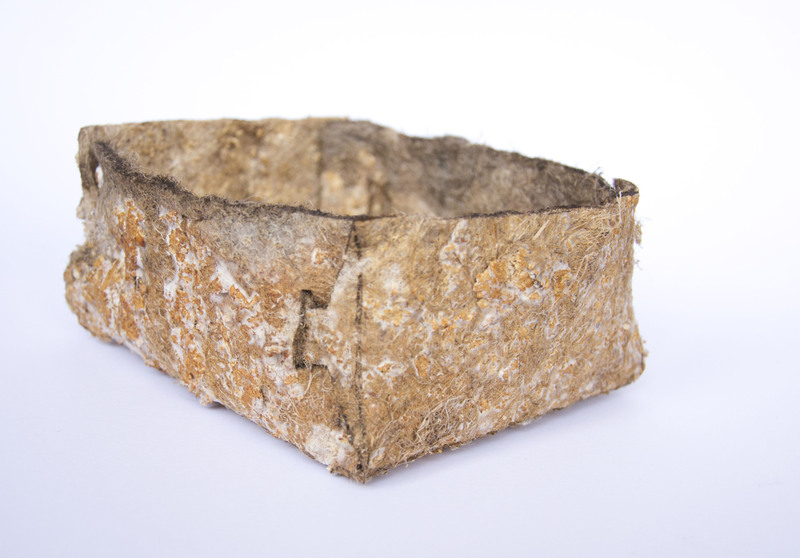 These blocks are a combination of sawdust and mycelium (the pre-stage of a mushroom). To optimize the circular food-system of Uit Je Eigen stad, sawdust is replaced by a used hemp-mat. The spores of a Shiitake mushroom are injected into the mat and in about two weeks the mycelium is spread out over the mat and the mushrooms start to sprout. 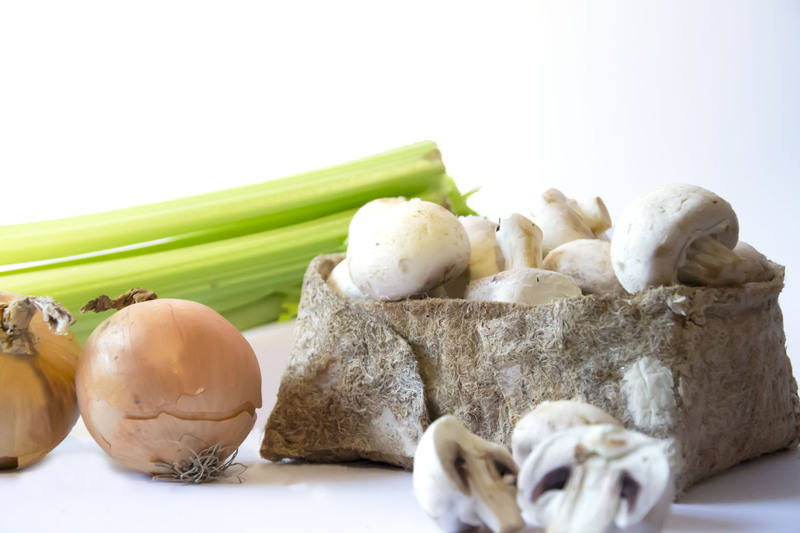 In the right environmental conditions, mushrooms can be full-grown and could be harvested after approximately one week. The material that is left, is the hemp-mat, overgrown with mycelium. Because of the mycelium, the material becomes waterrepellent, it becomes an insulation material and is fully compostable. Likewise, the material becomes more valuable and can be used for several products. 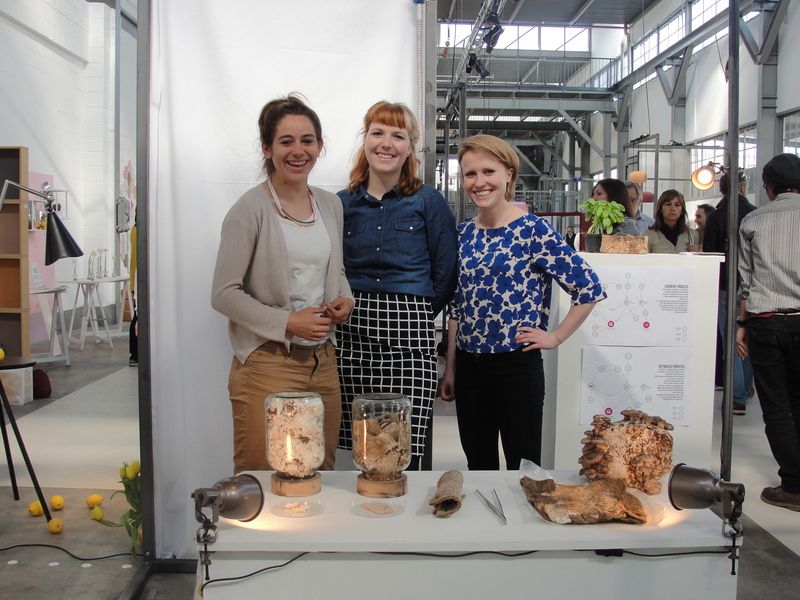 For Uit Je Eigen Stad, a packaging material for the mushrooms, grown on top of the material, is designed. To make the material suitable for the final packaging, it will be pressed in a mold. 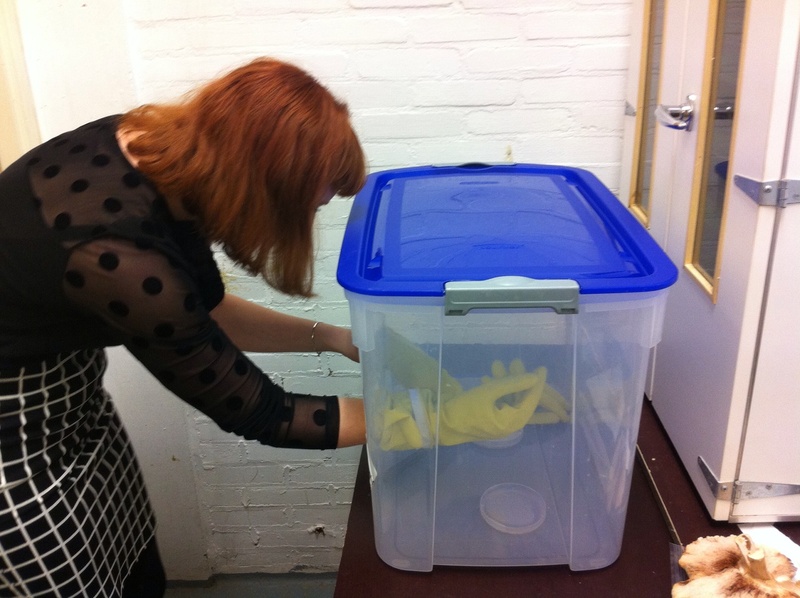 Afterwards it will be placed in an oven, at high temperature, to stop the mycelium from further growth. The shape of the packaging will be lasercutted and the tray can be folded into shape. This way of producing food and products lengthens the life of a hemp-mat to circa three times the current lifetime, and makes buying mycelium blocks superfluous. “What we are presenting at the Venture Lambrate” may be closer to a way of thinking, rather than a physical product. If we can make designers think about what materials they are using or make consumers think about what products they buy or recycle, we have reached our goal. But only for now. We definitely did not call this project ‘The Factory Of The Future’ for no reason”. * ‘Uit Je Eigen Stad’ creates an environment where people from Rotterdam can see, experience and taste the production of the food and the food itself. 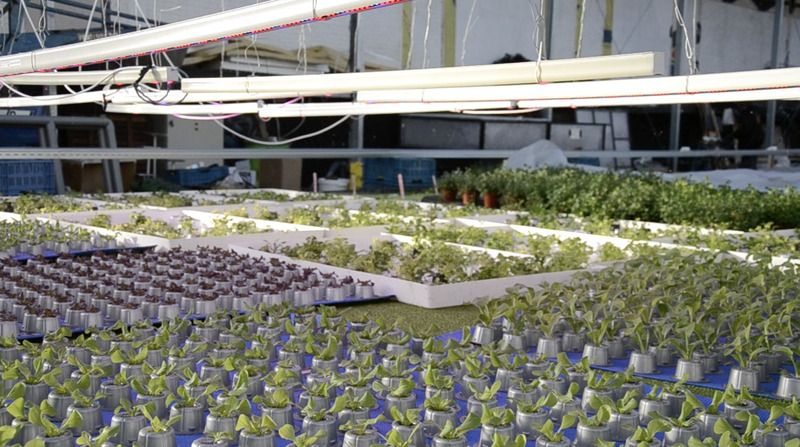 Through their vast fields, aquaponic system, chicken farming and mushroom cultivation, Uit Je Eigen Stad is bringing the production of food back into the city. ** An aquaponic system is a sustainable ecosystem, used to produce food.